Video: LeBron James demonstrates the B.U.S principle. While most of us can’t give five-star basketball advice, all of us are capable of using the BUS principal to be the best Dads and father-figures that we can be. – B – Being There for them. – U – showing Unconditional Love. – S – help them realise how Special they are. With these three things in mind, look for opportunities to spend time with the children in your life. Talking, cheering them on, playing, working on a chore, task or project – or even just relaxing are all opportunities to B.U.S with your children. Where possible, Being There one-on-one with your child, helps them to feel even more Special and Unconditionally Loved. 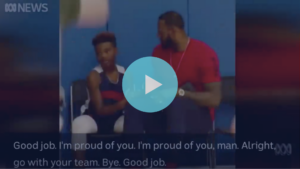 Just like LeBron – verbally recognising your child’s struggles and triumphs will help them feel understood, supported and loved through their experiences. The Special attention you pay helps them to feel they are worthwhile and supports a general sense of wellbeing and self-confidence. Dancing with your children can be a memorable and special moment you share with them. So put on your silly hat and dance with them! Don’t assume your child will never be offered illicit drugs or will know how to avoid pressures to take drugs.